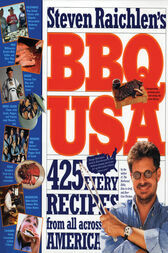 In 450 recipes covering every state as well as Canada and Puerto Rico, BBQ USA celebrates the best of regional live-fire cooking. Finger-lickin' or highfalutin; smoked, rubbed, mopped, or pulled; cooked in minutes or slaved over all through the night, American barbecue is where fire meets obsession. There's grill-crazy California, where everything gets fired up - dates, Caesar salad, lamb shanks, mussels. Latin-influenced Florida, with its Chimichurri Game Hens and Mojo-Marinated Pork on Sugar Cane. Maple syrup flavors the grilled fare of Vermont; Wisconsin throws its kielbasa over the coals; Georgia barbecues Vidalias; and Hawaii makes its pineapples sing. Accompanying the recipes are hundreds of tips, techniques, sidebars, and pit stops. It's a coast-to-coast extravaganza, from soup (grilled, chilled, and served in shooters) to nuts (yes, barbecued peanuts, from Kentucky).